U.S. 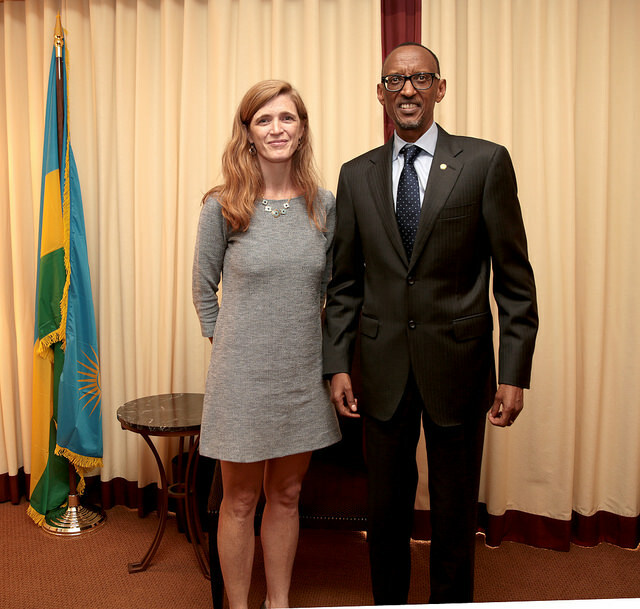 Ambassador to the U.N. Samantha Power is on a mission to save Africans from African savagery. She wants you to call 1-800-GENOCIDE so she can send in the Marines or other U.S. Special Forces. Her entire career is based on a historically inaccurate, decontextualized and grossly oversimplified account of the 1994 Rwandan massacres, during which the U.S. “stood by.” From now on, she moralizes, U.S. citizens must be “upstanders,” not bystanders. “Never again” can we fail in our moral duty to stop the world’s dark-skinned, backward peoples from massacring one another over ethnic difference. Power fails to note that the U.S. stood by intentionally, not indifferently, in Rwanda, until U.S. ally Gen. Paul Kagame won a war of aggression begun four years earlier. The Rwandan death toll was many hundreds of thousands higher than the Pentagon had projected, but otherwise, everything went according to plan. Two years later, the Congo Wars began, and the U.S. and U.K. unseated France as the dominant power in the African Great Lakes Region. Now, having successfully advocated for U.S.-led NATO wars in Libya and Syria “to stop the next Rwanda,” Power has her sights set on the tiny, impoverished East African nation of Burundi. Burundi shares the Hutu-Tutsi-Twa ethnic divisions with neighboring Rwanda and a highly geostrategic border with the resource rich Democratic Republic of the Congo. U.S. troops typically appear only as “advisors” south of the Sahara, although “Mass Atrocity Response Operations; A Military Planning Handbook” describes the swift, surgical deployment of U.S. Special Forces as a blueprint at the ready. For now there are plenty of African troops serving under U.S. military command and grateful to receive the salaries that boost their class status in Africa, though they’d be considered poverty wages here. All but a few African nations now have soldiers serving within AFRICOM, the U.S. Africa Command, and Burundi’s belligerent neighbor Rwanda is one of the greatest troop contributors. One complication of the Burundian situation is that Burundian troops serve in AMISON, the Pentagon-led African Union Mission to Somalia. Fighting and casualties have already taken place on Burundi’s tense border with Rwanda, and this week five of Burundi’s ruling party leaders, including the Burundian security and intelligence chief, were assassinated. This makes it clear that President Nkurunziza, who is hugely popular with the country’s rural Hutu peasant majority, could be the next target. And, it alarms all those who remember that the assassination of three Hutu presidents within two years, 1993-1994, precipitated the Rwandan and Burundian bloodbaths of the 1990s. Samantha Power has decried assassinations on both sides and threatened sanctions, but she lays all the blame for Burundian crisis on President Nkurunziza. Why? Because he claimed the constitutional right to be elected twice by universal suffrage, then won by 69 percent. However, she spoke not a word of protest in 2010, when Rwandan President Paul Kagame claimed the same right and won by a thoroughly implausible 93 percent majority. Or in 2011, when President Kabila claimed the same right, then claimed a victory that “delegitimized all Congolese institutions,” according to the Carter Center’s election observer mission. The regional and ethnic tensions now fiercely focused on Burundi are no doubt real, the danger of mass violence great, but the African Great Lakes Region is so resource rich that the resource interests of the world’s industrial and military power elites are always in play behind the news and Samantha Power’s latest African anxieties.